As a true freshman "too talented, too physically gifted" to redshirt, Max Borghi is making an immediate impact in Pullman. But, if you ask anyone from Borghi's home state of Colorado — including, say, Stanford's Christian McCaffrey — they'd have seen this coming. 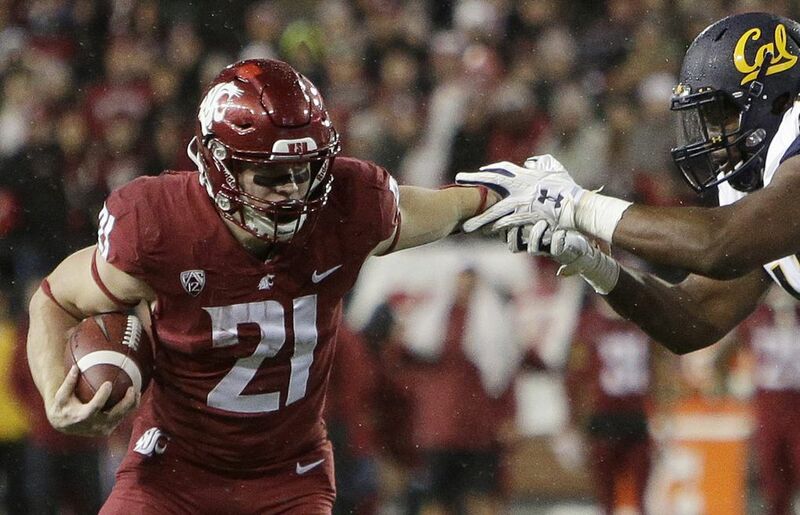 PULLMAN — Max Borghi was born to play football. Anybody might jump to that conclusion watching Washington State’s true freshman move up and down the field with a leather ball tucked between his arms. Already this season, Borghi’s thundering runs have netted the Cougars six touchdowns on the ground, while his soft hands have been responsible for another three through the air. Everything Borghi does on a football field seems to comes second-nature — like it was passed down from somebody with the same last name. If Borghi told you he was a third- or fourth-generation running back, you’d have no choice but to believe it — and yet it wouldn’t be any further from the truth. Max Borghi, born Massimiliano Borghi, is the son an Italian immigrant who spent his childhood kicking a soccer ball through the streets of Varese, a northern suburb of Milan. Steve Borghi wasn’t introduced to American football until his family moved to New York in elementary school and seeing the sport on a television for the first time was a befuddling experience he still remembers with vivid detail. Steve’s spouse, Julie, was raised in Colorado and occasionally watched the Denver Broncos on Sunday afternoon with her father, but had no vested interest in football as a lifelong gymnast. Julie received a cheerleading scholarship to Florida Atlantic University — that’s where she met Steve, and the couple spent nine years together in the Sunshine State. That’s where they conceived their first child, Marco, before eventually relocating to Colorado and giving birth to another son. Forecasting the challenges of writing “Massimiliano” on every school paper and test, Steve and Julie shortened their second child’s name by five syllables, to “Max.” Unknowingly at the time, that decision would also make life easier for ESPN commentators, who have to call Borghi’s name at least a dozen times whenever the Cougars are on national television. Steve and Julie Borghi are still stunned their middle child has become an overnight sensation for the country’s 10th-ranked college football team. They never pushed Max toward the sport, but now he’s on the verge of breaking WSU’s freshman scoring record, which would require Borghi to score four more touchdowns in the final four, possibly five games, this season. Deon Burnett currently has it with 12 TDs. A village-sized crowd of family members, friends, former teammates and coaches will make a short drive to Folsom Field Saturday afternoon to see Borghi chip away at that record when WSU (8-1, 5-1,) takes on Colorado (5-4, 2-4) at 12:30 p.m. PT (ESPN) in Boulder. Michael Marquez is the one who convinced Steve and Julie Borghi to buy their son his first football helmet. And he’s still waiting on a royalty check. A promising soccer career had already started to take shape for Borghi in the second grade when he befriended Ryan Marquez, another young multisport athlete who should’ve been playing two or three levels above his age group. Ryan’s father Michael, a former CU tailback who had a cup of coffee with the NFL’s Broncos, was coaching a local Little League football team called the Arvada Buffaloes. Borghi popped with his natural athleticism, outpacing everyone on the soccer field, but Marquez felt his skills were better suited for the gridiron. So he made a pitch to Steve and Julie Borghi. But Borghi pleaded to play on the same team as Ryan, so Steve and Julie caved in and purchased a used helmet from the local sporting goods store. That decision kick-started one of the most decorated football careers by a running back in Colorado’s history. The holy grail of the Jeffco (Jefferson County) Midget Football Association is the Carnation Bowl. While Borghi and Ryan Marquez played on the same Arvada Buffaloes Little League team, the duo advanced to that game every season. And more notable than that, since they were 7 years old, Borghi and Marquez have never started a season together that didn’t end with an appearance in a championship game. At this point, there was no slowing Borghi’s legend. Some of those youth games were divided by total number of plays, rather than timed quarters. Teams would get between 20-30 plays per half and in one particular game, the Arvada Buffaloes were trailing by five points, on their own 1-yard line and down to their last play. Marquez, at quarterback, whipped a pass between two defenders. On the other end of the throw was his good buddy, Borghi, who caught the ball and gashed the defense for a 99-yard touchdown to win the game. Borghi became notorious for making plays like that with the state’s eye watching. He started to get recognized in strange places — something Julie and Steve Borghi weren’t quite prepared for while their son was still in middle school. Borghi’s swift running and crisp cutting had given the running back some level of popularity by the time he arrived at Pomona High School to play for Jay Madden’s football program. Pomona isn’t the closest high school to Borghi’s Arvada home, but he, Marquez and a handful of the Arvada Buffaloes decided to play for Madden and Pomona, rather than attend Arvada West or Ralston Valley. Michael Marquez and Madden were longtime friends and former Pomona High teammates, and the group of incoming freshmen wanted to deliver the Panthers their first state title in three decades. Borghi was a varsity-level player when he stepped on campus at Pomona, but Madden wanted to get his freshman team off to a good start, so that’s where Borghi began. The Panthers ran toss plays to Borghi on the first snap of each of the first four freshman team games. He scored on all four. Borghi was promoted to varsity for the fifth game of the season. A few games later, against Columbine, he rushed for five touchdowns — “on about seven carries,” Madden added. He turned in some impressive highlights along the way. Madden estimates a Borghi hurdle against Ralston Valley harvested “about 25,000 likes” on Twitter, although the 90-yard touchdown got called back because hurdling isn’t permitted at the high school level. “But it was still worth it,” Madden said. Borghi rushed for 670 yards and eight touchdowns as a freshman. His sophomore encore was a near-1,000-yard season. Borghi recorded 998 yards on the ground and nine touchdowns, to go with 503 receiving yards and five touchdowns. Pomona lost in the state title game 29-26 to Valor Christian. The Panthers were favored to win the championship Borghi’s next season, but Pomona’s junior running back — already with 824 rushing yards and 15 touchdowns — felt his knee buckle on a reverse play during the state quarterfinal game. The audible sound of Borghi’s ACL tear could be heard from the Pomona sideline. Julie Borghi was coaching the Panthers cheer team. During their “redemption tour” as Madden labeled it, the Panthers still managed to reach the state title game for the second year running, but with their do-it-all running back and a few other key pieces, Pomona once again bowed to Valor. During Borghi’s eighth-grade year, his father took him to Mile High Stadium in Denver to watch one of those dominant Valor Christian teams play in the state title game. Not unlike everyone else in Colorado at the time, Borghi was mesmerized by Valor’s senior running back, a Stanford commit who whizzed through Fairview’s defense for 140 yards and four touchdowns to win the 5A championship. Christian McCaffrey was the greatest thing Colorado had ever seen on a high school football field and he finished his Valor career with 140 touchdowns. 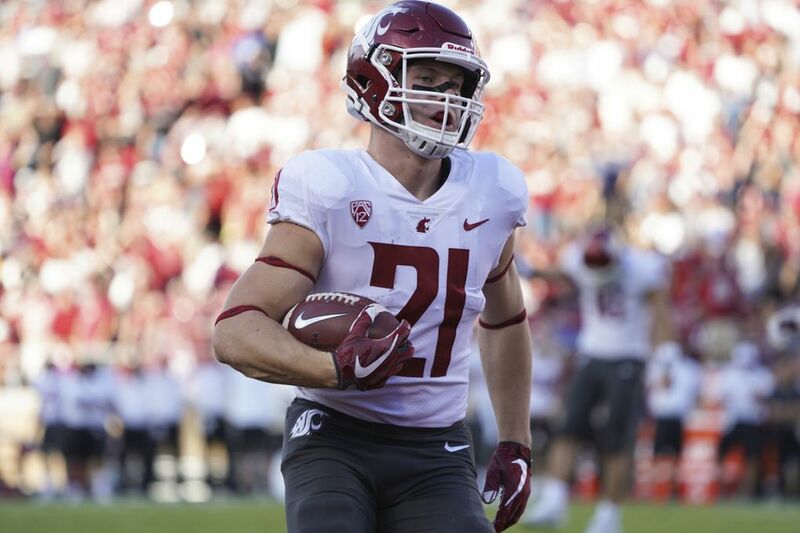 McCaffrey instantly had a fan in Borghi, who closely followed his college career and eventually cited Stanford as his “dream school” because of his affinity for the Cardinal’s running back. It was a chance encounter that eventually connected the two. Borghi had been seeing a clinician at CU while rehabbing his ACL, but was later referred to Loren Landow, an esteemed strength and conditioning coach in Colorado who owned a state of the art performance center in Centennial and specialized in preparing NFL hopefuls for the Combine. Landow, now the head strength and conditioning coach for the Broncos, has worked with hundreds of NFL players and other athletes, including Olympic swimmer Missy Franklin. He didn’t often work with high school-aged athletes, but realized Borghi was a rare breed and invited him to rehab at his facility. During one of his visits, Landow lined up a surprise meeting for Borghi — with McCaffrey. McCaffrey and Borghi worked out together a handful of times as McCaffrey was prepping for the NFL and Borghi was recovering from his injury. That was valuable for Borghi, but more importantly, the Pomona running back — who at this point was a highly-coveted college prospect — also leaned on McCaffrey’s mentorship while he went through the recruiting process. There are unmistakable similarities between the two on the field, as well. Both are speedsters who demonstrate impressive field vision and show solid pass-catching abilities. Most who’ve seen both players seem to think Borghi is quicker. It’s not just their running styles, either. “They look a lot alike,” Julie Borghi said. Landow’s recovery plan got Borghi back onto the field one month earlier than expected and the Pomona tailback, who had been elusive and fast but never truly powerful, transformed his running style and started to embrace the physicality of his position. Borghi led the Panthers to their third straight title game. In it, he rushed for 247 yards on 31 carries, scoring three touchdowns to lead Pomona past Eaglecrest 56-49 in the highest-scoring 5A title game the state had ever seen. Marquez, the Pomona quarterback, Borghi and Washington State wide receiver commit Billy Pospisil were known as the Panthers’ “big three.” They combined for 779 yards of offense in the state title game. Borghi cemented his Pomona legacy with 1,690 rushing yards and 27 touchdowns as a senior. He also returned a punt and a kick for a touchdown. This Saturday, the Panthers have a playoff game against Arvada West at noon. It won’t stop them from taking a caravan of coaches over to Boulder following their high school game to see Borghi play the Buffaloes. Madden and his crew hope to make it there by the second quarter of the WSU-CU game. Borghi’s estimation of a few-hundred? Maybe it isn’t so much of an exaggeration. Nor is his legend in the state of Colorado. Borghi’s first college offer came from Central Michigan. Then the Colorado schools jumped on board — first Colorado State, then CU. By his senior year, the Pomona tailback was flush with options. He’d eyeballed Colorado at a fairly young age — not a surprise given his Little League coach played there and his midget team was named the Buffaloes. Borghi attended Colorado’s junior days and Marquez’s access to the CU facilities allowed the running back to train there from time to time. Max pledged to CU and Mike MacIntyre on Feb. 17, 2017. But the Buffaloes tapered their recruiting efforts after that. Understanding that a verbal commitment isn’t a binding agreement, most schools continue to pelt their commits with mail and phone calls. Curiously, CU didn’t follow through on that front when it came to Borghi. 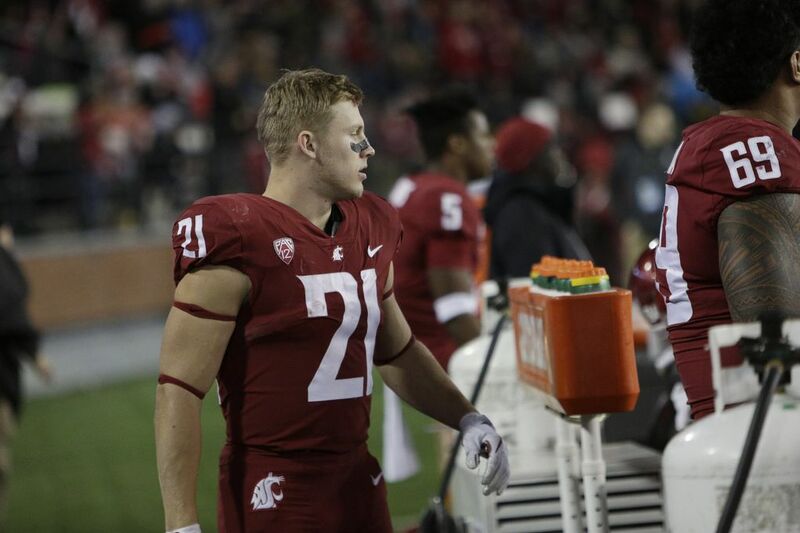 It may not have been the sole reason for Borghi’s decommitment, but the running back rewarded the loyalty shown by Leach and primary WSU recruiter Jim Mastro when he committed to the Cougars on June 30. “I thought Max was a heck of a player, always have,” MacIntyre said earlier this week. “We offered him really early, he was committed to us and then he changed his mind. That happens in the recruiting world. I’m so happy his knee is completely healthy and he’s able to go. Still, even with a verbal commitment to WSU, Borghi had a choice to make as Signing Day neared. Stanford came in with heavy interest late in the recruiting process and the opportunity to play at the school where his idol and mentor, McCaffrey, had starred at was plenty alluring. Borghi didn’t give any hints as to which Pac-12 North school he was leaning toward — not even to his parents, who were told their son wanted to make his decision a surprise. So, two days after the Early Signing Period commenced, Borghi decorated a dining room table and dresser at his Arvada home with a WSU flag and a few-dozen letters he’d received from the Cougars. “He wouldn’t tell us at all,” Julie said. Mastro’s no longer with the Cougars. In January, about a month after he’d secured Borghi’s signature, the longtime WSU running backs coach left for the same position at Oregon. 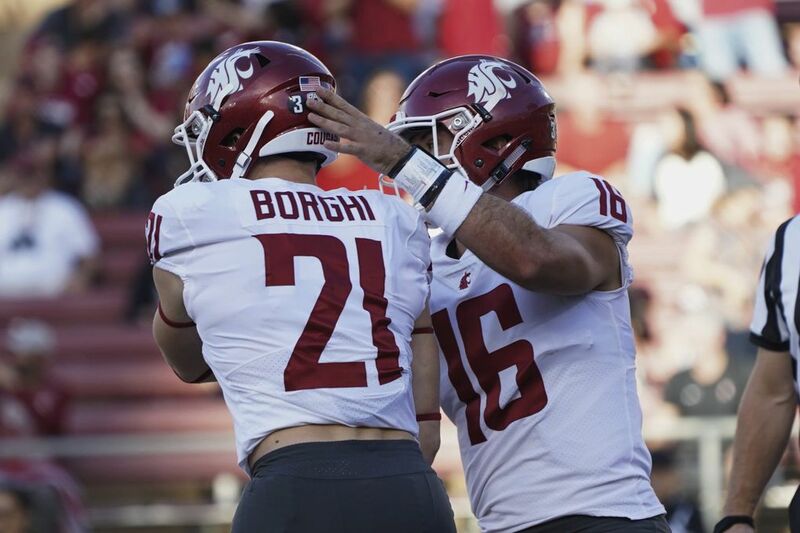 Borghi enrolled early at WSU — an idea that former Pomona teammate and current CU offensive lineman Jake Moretti planted in his head — and quickly rose up the Cougars’ running back depth chart. He had a few head-turning runs during spring camp and was frequently shedding tackles from his older teammates on the other side of the ball. It didn’t take Leach and his staff long into fall camp to decide Borghi would become part of the running back rotation, alongside junior James Williams. If it’s any indication of what he’ll pull off this weekend against the Buffaloes, Borghi’s already excelled in the games that mean the most to him. Against Oregon and Mastro, he was able to squeeze out 91 yards on 17 offensive touches and caught one touchdown pass. The next week at Stanford, the school he could’ve wound up playing for, Borghi hauled in another TD. In Pomona, Colorado, they’re calling it a good start.